The perfect complement to any look, these striking marquis shaped drop earrings offer a sparkling display like none other. 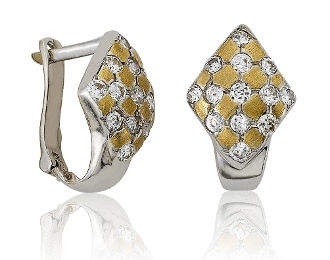 Masterfully crafted in 14 Karat white gold, 26 dazzling cubic zirconia solitaires are bezel set and accented by intricate drops of brushed yellow gold giving the texture and look of snakeskin. These crave-worthy earrings come alive with the fire two-toned gold and secure with French back latches.